To anyone at the show right now reading over this….. thanks for making a first-timer feel so welcome – it’s been awesome. I’m getting a lot out of the sessions and the socializing here. I’ve met some folks who not only were very approachable but ready and enthusiastic about conversations with a first-timer. I definitely try not to be the “interruption guy” but have managed to at least chat with some who I’ve wanted to meet for a long time and had extended conversation with many who I respect in the industry. The booths were a real mix of knowledge levels The Google booth was well staffed with people who knew the stuff really well. Yahoo’s API party was the same way. It’s not suprising though that a few of the vendors live in the frictionless, ideal world of pure numbers. Introduced to a pile of real-world nastiness, their answers became distinctly less clear. Thus far my favorite single presentation has been Gord Hotchkiss’ take on changes in SEO in the age of personalized search. Barry liveblogged the whole thing but what I got from this was that we’ll be optimizing around buckets of behaviors and themes. Buzz sites launched by SEMs and run by “Buzz” services will provide methods for rapidly inserting yourself into the web history of large numbers of people, thus influencing the Personalized search results for the future. It’s still a massively evolving space. I think it will change everything, and much of what we’re worrying about now will be irrelevant. I originally knew about Gord because he refers a fair amount to one of my interests, eye tracking studies, which have been popularlized for web design and marketing uses. Graywolf makes the point it’s not clear enough that one is using personalized search (cite heat maps) and that it “dumbs down” the searchers putting more control over what is shown in Google’s hands – which may not be such a healthy long-term thing. Barry’s got some great coverage, and Carolyn (Cshel) has posted lots of good photos (search Flickr for “cshel smx” until she posts a link on her site.). 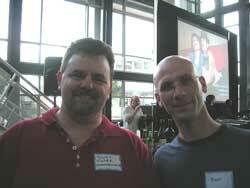 Photo above is from Cshels flickr feed – Scott and Brent Csutoras. One more day to go – I can’t wait!